Certified Organic and Animal Welfare Approved. Our chickens are raised in a cage-free, free-range, certified organic fruit orchard. They are fed a diet of 100% organic grains with fresh organic greens and fruit added to supplement their feed in the winter months. We use no hormones, routine antibiotics, stimulants or any chemical additives. We do not kill any chicken for meat, so as they age, we end up as a nursing home for retired chickens. We are state-licensed and inspected as egg producers. We work hard to provide a habitat that is healthy and enriching for the chickens. Our farm is Animal Welfare Approved, which, according to their website, is the very highest standard of care. 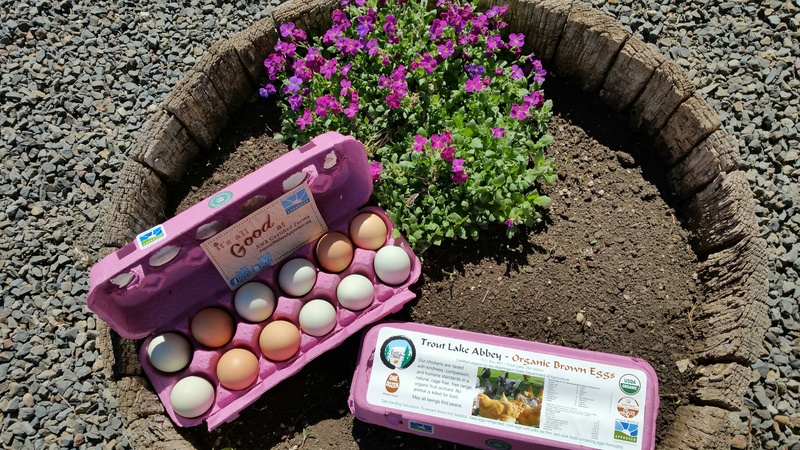 Our eggs are available for sale in our distinctive deep pink carton in Trout Lake at the Trout Lake General Store and at the Abbey. Barred Rocks (black and white speckled hens). These birds are known as “heavy breeds” which produce wonderful and nutritious brown (or green) eggs. When a Buddhist monk tends the chickens at night, they will chant a blessing and ask for a peaceful life for the chickens.